The dry summer may not have been great for agriculture in Ireland this year, however it did produce record results for solar in Northern Ireland. 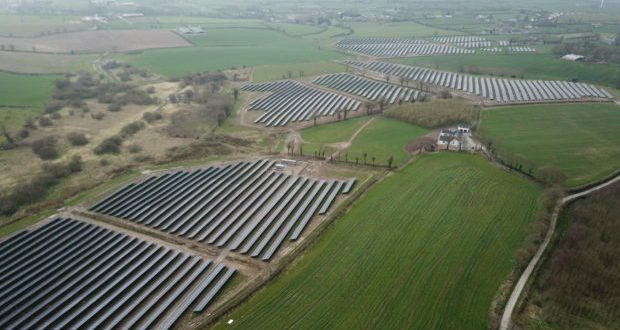 On the BNRG Renewable’s developed solar project at Laurel Hill in Co. Down, record production levels were recorded from the project throughout the summer. The 14.2 megawatt (MW) solar PV plant located near Donaghcloney in Co. Down, developed by Irish company, BNRG Renewables and constructed by Engie Fabricom is a highly innovative site and the last solar project in the UK to be connected to the grid under the UK’s Renewable Obligation Scheme. The project was fully accredited this summer by Ofgem. The project was recently acquired from BNRG by the Foresight Group (Foresight) who had previously part-financed project construction with BNRG. Foresight’s acquisition financing involved debt provided by NatWest. Project Manager at BNRG Kaj Christiansen stated that “this is not the first project that we have built with Engie, nor the first transaction that we have completed with Foresight. It was a pleasure working with these partners again as the teams have worked well together”. The 68-acre site is made up of 44,381 solar panels and during the summer months generated almost 8GWh of green electricity which is equivalent to burning 3,500,000 kg of coal. The project is expected to provide enough electricity to power over 3,200 homes annually for the next 30 years. The sensitive approach to planning and design was adopted by BNRG. Christiansen commented “our ambition was not only to limit adverse effects on the environment but to enhance it. The site has now been landscaped with over 20,000 native shrubs and semi-mature woodland trees”. Further biodiversity measures include the dedicated wildflower zones that are located throughout the site where meadow land is created, and indigenous species can thrive without agricultural interference. BNRG worked with local stakeholders and residents alike to ensure the smooth transition of this 68-acre site into a green energy hub. Once the wildflower zone has become established, the site will be sheep grazed, which both retains the agricultural spirit of the land and the surrounding area while also allowing for a cost-effective approach to field maintenance. David Maguire, Director at BNRG emphasised that “The project was particularly important for BNRG, as it was the first large scale project that we energised on the island of Ireland. We are delighted with the result and hope it’s the first of many in Ireland”. He revealed that BNRG is currently developing over 300MW of projects in the Republic of Ireland through a 50:50 joint venture with Neoen, a French Independent Power Producer with a €1.6bn market capitalisation. The projects are being developed in anticipation of a competitive auction commencing next year. BNRG’s activity is not just limited to Ireland, they recently commenced construction on 33MW in Oregon, USA and have a large portfolio of over 225MW under development in the North Eastern USA and a similar portfolio in Australia. The decision by the European Union to lift restrictions on Chinese solar imports will increase the viability of green energy projects in Ireland, an industry group has said. David Maguire, head of the Irish Solar Energy Association, a representative body, said that the move could bring down the cost of large-scale solar projects here by almost 10 per cent. The EU announced last week that it was lifting taxes on solar panels imported from China. The bloc introduced taxes in 2013 after accusing China of selling their solar panels at artificially low prices in order to shut down European competition. It decided to reverse the decision last week, saying that it would help with the EU’s renewable energy targets. The move was welcomed by many in the renewable energy industry, who said that the extra supply and competition should help to make solar projects cheaper. Mr Maguire said that the change could be particularly helpful in Ireland, where developers were struggling to get projects over the line. He said the impact on end prices could be larger than it normally would be, as the US has recently introduced tariffs on Chinese solar panels, making it even more attractive to sell into the EU. “While there is uncertainty over the scale of the impact I think it would be safe to say that there will probably be a reduction of between 7 per cent and 8 per cent, which is a big reduction in cost,” he said. While many countries with relatively similar climates have large solar industries, there are no commercial-sized solar projects in Ireland. Several years ago a slew of would-be developers applied for planning permission to build solar farms all over the country with the expectation that a government support system would make building commercially viable. Such a system has yet to be introduced, leaving much of the land still undeveloped, but the government did recently publish a proposal of how it could fund renewable energy projects which Mr Maguire said would work for the solar industry. He said that the further reduction in cost as a result of the EU decision would make subsidising solar energy cheaper for the state. “It’s good news for Ireland and for the energy industry generally,” he said. The Irish Solar Energy Association has previously highlighted the potential for Ireland if a viable solar energy industry were developed in the country. 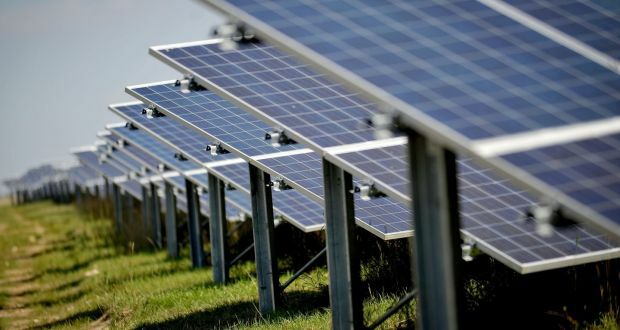 A report carried out by KPMG, which was commissioned by the lobby group, found that more than 7,000 jobs could be created in the building and operating of solar farms in Ireland. The association has estimated that state support would cost about €23 million a year. While the potential support needed by the sector has reduced as costs have come down, critics say that the industry should just wait until costs come down to a commercially viable level to build. The industry has argued that building solar farms would help Ireland to work towards its binding EU 2020 renewable energy targets, of which it is currently due to fall short. By 2020, 16 per cent of Irish energy is due to be produced by renewable energy. For every percentage point the state undershoots, it is liable to be hit with fines of about €100 million. He doesn’t mean to, but David Maguire is completely talking over my head. Mr Maguire is the boss of BNRG Renewables, one of the country’s only solar power developers of scale, and head of the Irish Solar Energy Association. At the moment he is eagerly describing how a type of state support for the renewable energy industry would benefit both businesses and the taxpayer. The only problem is that the concept of contracts for difference (CFD) is a tough one to grasp. Even the name takes a fair bit of thought to process. So when Mr Maguire says it will “just take a minute” to explain the concept to me, I’m doubtful. “I don’t know if you’re aware of how CFD works?” he kindly asks. Irish Solar Company, BNRG, Breaks Ground in USA. This success in the US represents another major milestone for BNRG after the successful completion in March 2018 of the company’s Laurel Hill project in county Down, Northern Ireland. This project, which is over 14 megawatts, is the last large-scale renewable energy project in the UK to benefit from the Renewable Obligation Certificate (ROC) scheme. After being energised in March, the project will supply electricity to the equivalent of over 4,700 homes every year for over 30 years. In addition to activities in Northern Ireland, BNRG has been building up a significant pipeline of 300 MW of projects in the Republic of Ireland in partnership with Paris-based Independent Power Producer, Neoen. Progress has been rapid on this portfolio of projects with planning permission and grid connection agreements secured on six projects in the South and East of Ireland. The Company is investing in the development of projects in Ireland in anticipation of policy support by way of competitive auctions. The Renewable Energy Support Scheme is due to be announced by Minister Naughten shortly. BNRG started developing projects in the US later than they started in Ireland, yet they are already constructing their first US projects. The Company expect to commence construction on the first projects in Ireland next year. BNRG is also looking further afield and recently opened an office in Singapore and moved into the Australian market where they have agreed commercial terms with a local company to develop a significant portfolio of large scale projects. The geographic footprint of this Irish Company has ensured that it has flourished in uncertain market conditions. Maguire explained that “the strategy of the Company is to be active in a number of counties at the same time to mitigate against political or regulatory uncertainty and to ensure that you always have assets under development, construction and operation at any one moment in time”. In a challenging global market, BNRG have developed a formula to navigate successfully and grow the business. 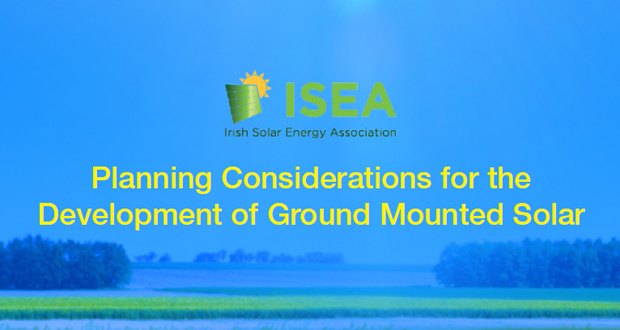 This document provides planning considerations for the development of utility scale, ground mounted solar. The benefits of solar energy need to be seen in communities or else there is a risk that large projects will face opposition similar to that encountered by onshore wind farms, a conference has heard. Irish Solar Energy Association (ISEA) chairman David Maguire told the organisation’s annual conference there was a need for community involvement in solar energy projects but this should not be “green washing”. Providing roof-top solar panels in schools would enable communities to see tangible benefits and the resulting long-term energy savings should go directly to the schools, he suggested. Mr Maguire confirmed hundreds of solar energy projects were in the planning pipeline – representing investment of more than €1 billion but there was no clear route to market or policy framework for the energy generated, and accessing the electricity grid was difficult and expensive. However, the Government is finalising a renewable electricity support scheme (RESS), he noted. Photovoltaic solar power was the only renewable energy technology that could quickly close the gap in Irish renewable energy targets, and help reduce carbon emissions, he said. Enabling this would create 7,000 direct jobs, save the exchequer €210 million a year, and maintain Ireland’s attractiveness for foreign investment. He warned, however, that the “green branding [of Ireland] is evaporating before our eyes” because of the State’s lack of progress in addressing climate change. Green Party leader Eamon Ryan said wind energy lessons needed to be heeded as large solar projects could be a recipe for dividing communities if not approached correctly. There was a global move to achieve 100 per cent power generation from renewable energy sources this century, he said, but he sensed some in the administrative side of Government did not believe the game was over for fossil fuels. Nick Holman, of the energy company BNRG Renewables, said foreign investment in Ireland would be under threat if the State did not have adequate supplies of electricity generated from renewable energy sources. While the provision of data centres for companies such as Amazon, Google and Microsoft was a success story for Ireland, many multinationals were “now demanding 100 per cent renewable electricity”, he added. Ireland was not in a position to supply that demand – if it wasn’t able to do so in the near future it would be “a disincentive for FDI”, he added. Mr Holman said solar energy could step in and fill the obvious gap on delivering on climate change targets and the provision of renewable electricity. Taoiseach Leo Varadkar said he wanted to “do more” to unlock the potential of renewable energy sources, move away from fossil fuels and help deliver greater security of supply in Ireland. This past weekend (July 22nd, 2017) our lads in Portland won the Gorge Cup 2017! Next stop Denver in September for the Nationals!